Australian super middleweight contender ‘Bangin’’ Bilal Akkawy 17-0-1 (14) believes that the versatility of Saul ‘Canelo’ Alvarez 49-1-2 (34) will see him over the line against bitter rival Gennady ‘Triple G’ Golovkin 38-0-1 (34) in their rematch at the T-Mobile Arena on Las Vegas, Nevada this Saturday night. The 25-year-old Sydney slugger has been a lead sparring partner for Alvarez for his last two training camps. “I think Canelo’s much more versatile than Golovkin,” said the WBA number nine and IBF number 11 ranked contender in an interview with foxsports.com.au. “He (Golovkin) sort of just has that one thing where he keeps coming forward and he can’t really dance around. The only way he knows is to come forward and fight whereas Canelo is more of a complete fighter. Akkawy was drafted into camp for Alvarez’s aborted May 5 rematch with the WBC and WBA middleweight champion. 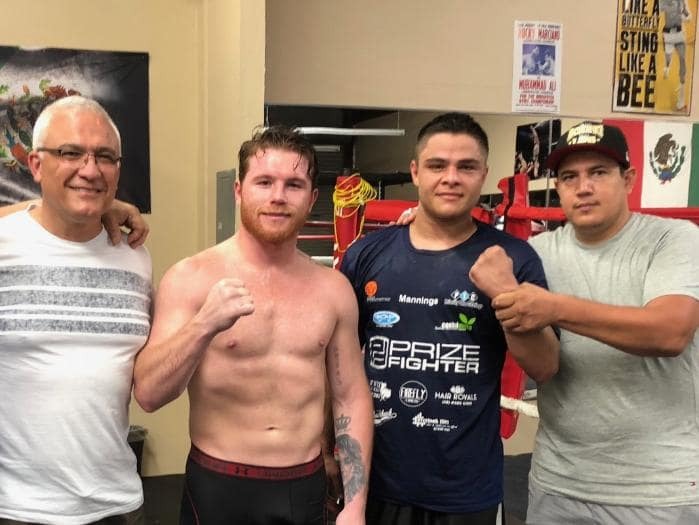 The heavy-handed Aussie created an impression on Alvarez’s trainer Eddy Reynoso who invited him back for the next camp for the rescheduled second go-round. It has been a great learning experience for Akkawy, who says the red-headed Mexican hero is far more powerful and difficult to hit than he appears on TV. “His power is deceptive,” he said. “Obviously I’d only ever seen him on TV before this and I didn’t expect him to hit as hard as he did. Also, I didn’t realise how elusive and how smart he was. Golovkin and Alvarez fought to a disputed draw in their first contest in September last year. The original May date for the rematch was scrapped after Alvarez twice tested positive for the banned substance clenbuterol in February, a result his team blamed on tainted Mexican beef. He was subsequently banned from boxing for six months. The dirty drug tests have only added to the bad blood on both sides, but Akkawy sees it as giving Alvarez the edge. “I do know that Canelo will be hungrier to win this fight after all that’s happened between the two of them. The talking and sledging, I’m sure that will push him to want to win even more,” said Akkawy. Alvarez looks decidedly leaner in pre-fight photos for this bout, which Akkawy believes is a strategic move to help him box out the 12 rounds at a fast and consistent pace. “The first time he showed he had the better boxing skills but his stamina let him down a bit,” said Akkawy. “This time he’s looking a lot slimmer and his work rate is a lot higher so if he can maintain that work rate then I think he will outbox him.